When we first moved into the house, there was one bar from wall to wall to hang clothes. The home had just been renovated so there weren’t shelves yet. It was at this point that I decided to get creative. I mean these closets are SMALL! And to compound the difficulty, there is a little bit of extra room on either side of the door. Think the shape of a Hammerhead, little opening and then it widens. But it really does little good if you can’t see it. That’s why I decided to remove the bar and install my shelves perpendicular to the traditional hanger bar/one shelf layout. And let me tell you, it has made all the difference! The closet is still tiny, but it is workable.I installed the shelves at different heights so I could maximize the space above and below my hanging clothes. This also helps it feel less claustrophobic when I need to find something. All you have to do is watch HGTV for about 3 minutes to see how the correct lighting can dramatically improve almost any situation. This is especially true in the tiniest of closets. They are dark, often packed with stuff and difficult to navigate. Adding a light helped immensely. You could go the permanent route and have an electrician install one, or if you are like me, you can run to IKEA and grab a pendant light which turns on and off simply by plugging it in. Honestly, this is my #1 tip, and it was such a simple fix. In Oscar’s closet I added several types of boxes and bins for smaller items and it has made keeping his clothes organized SO much easier. It just makes sense. I can see what I need and it almost feels like a walk-in. 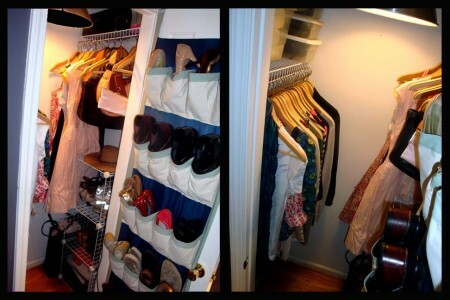 It’s so important to utilize every bit of space when you are dealing with a small closet. These solutions have worked wonders for us. Have you done anything to maximize a small space? I’d love to hear it! great ideas! i can so use these ideas in my halway closets! That's too funny. That is EXACTLY how I made more room in our old house's closets. I call it my mini walk-in. The quick switcheroo added so much space. It is good to find something worth reading. Seems like everybody is starting a blog and tossing up whatever hops into their head. Most of the time it does not make good sense. I am glad to see that is not the case here. wow! thank u so much! as a fashion blogger living in a 1960’s house, i have a LOT of clothes, but no where for them to go! this is ABSOLUTELY brilliant!